Streets of Willow is second longest of the three courses at Willow Springs. It's fairly tight, with a nice mix of curves and a couple straighter sections. Turn 13 spills out onto the skidpad area, hence the abundant space. The track is more often taken clockwise, but the counterclockwise configuration is also used. 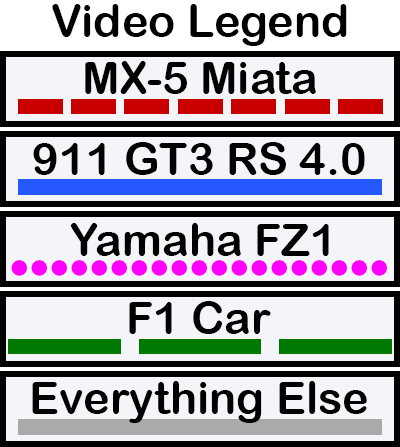 The differences in line selection for the vehicle types are mostly subtle (except for the F1 car). The motorcycle takes a much shallower apex at Turn 3 than the cars, since if you stay on the gas as hard as you should exiting Turn 2, a bike might not be able to get back to the right hand edge of the track before entering 3. No surprises through 4-5-6, but all vehicles should exit 6 wide and stays pretty close to the left all the way through Turn 7. Get on the gas hard out of 7 and let your speed carry you to the right side of the track. It will feel like you're apexing too early at 8, but this is what you want. You come fast out of 7 and set up a nice dual apex through 8. Many drivers make the mistake of staing left out of 7 and turning in late at 8. The section composed of Turns 9 and 10 can be taken incredibly quickly with the proper line. Al even has the Miata hard on the gas at 100 MPH all the way to about 100 feet past the apex at 9B. Depending on your grip level, you will have to brake sooner, but it's possible with good tires and track conditions. It's not entirely obvious just from looking at the line, but at 9A each vehicle is at or near full right turning. The steering straightens out as you pass the apex on the left, and then it's full turning left between 9A and 9B, and finally easing off after 9B before turning in for 10. So that's hard right, hard left, easing up, then hard left again. If you find yourself going right, left, right, left, you could be taking the section faster. There are a couple different approaches recommended for 10 through 12, so see which one works best for you. In the final turn that comes across the skidpad, the Porsche and Miata are 15-20 feet farther out than the motorcycle, so if you're on a bike it's probably best to keep it tight. For the longest time I thought the loud exhaust was the camera car, but nope, it was the blue one. I would like to see this driver try Al's line through the fishbowl (Turn 8). Instead he exits Turn 7 mid-track and turns in late. Could stand to be come faster out of 6 and stay left through 7. I didn't see a double apex in the fishbowl, either. Standard "A" group shennanigans. The camera bike almost causes a crash in the beginning, another rider almost highsides a couple minutes later. This rider could take Turn 1 faster in order for the momentum to carry him/her to the outside in setting up for Turn 2. I think turn-in for 3 is way too late as well. There are many other deviations from the recommended line but this video is more for getting used to seeing the track at high speeds/lean angles. This intermediate rider doesn't have the line selection quite honed in, but the video quality is nice, and it will help get used to going around the track on two wheels. Dang these little Karts are fast. I timed this lap and got 1:16, though, so maybe this is the wrong footage? I don't have a great reason for including this other than it's Eddie Lawson and it's cool.